Trekking through the jungle in Thailand perched high on an elephant, seemed both exciting and romantic to me. After researching this activity, I wasn’t so sure. Eventually we decided to visit Elephant Nature Park, and it was truly awesome! 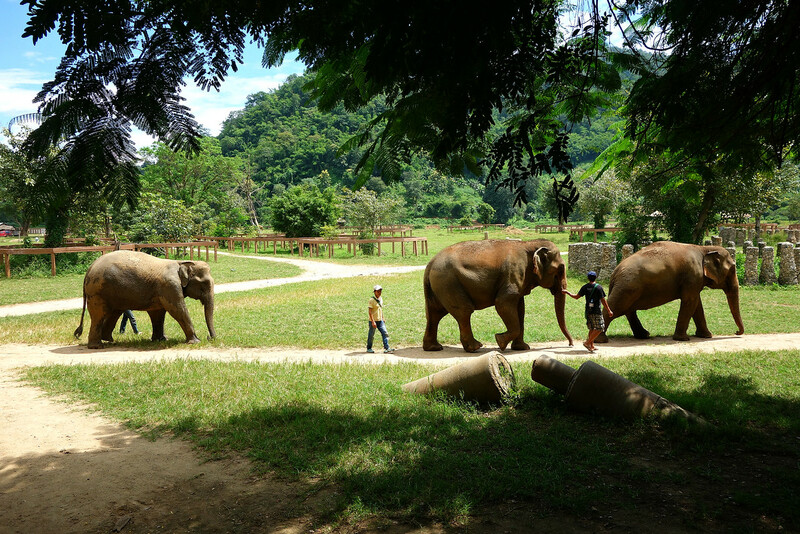 Elephant Nature Park initially caught my attention as it is ranked high on TripAdvisor. It is a sanctuary for abused and unwanted elephants, and we would have the opportunity to meet, feed, and spend time with these elephants. We wouldn’t be riding them, and the elephants would not be performing tricks. 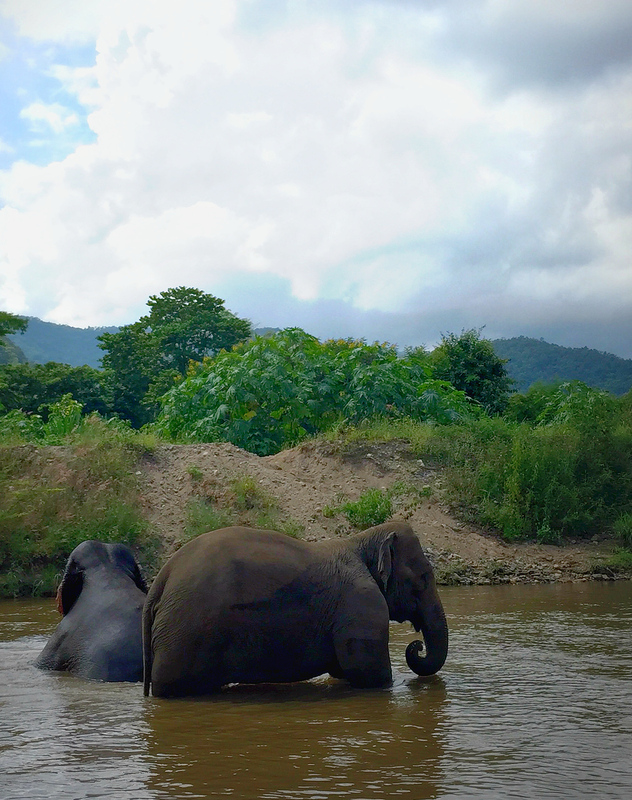 The park itself is in a beautiful setting, surrounded by mountains, and with a river the elephants can bathe in. A guide was with our group for the whole day, and he told us about the sanctuary, and a little about each elephant we met. It was really moving to hear the stories of family and friendship between the elephants. We were able to meet several of the resident elephants. Happy elephants after a mud bath. Some of the rescued elephants had formerly worked in the logging industry, some were kept to perform tricks and beg, others were used to give rides to tourists. 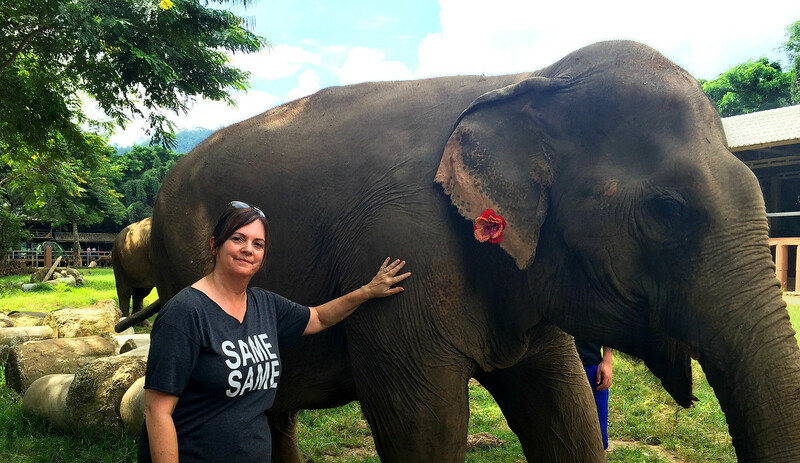 We met elephants who had their legs broken, who were blind, whose ears were scarred by abusive owners. Some elephants were abandoned because they were too old to work. Some are as old as 75-80, and at the sanctuary they can live out the remaining years of their lives with no more work or abuse. This elephant has a scar on his left foot from a land mine. 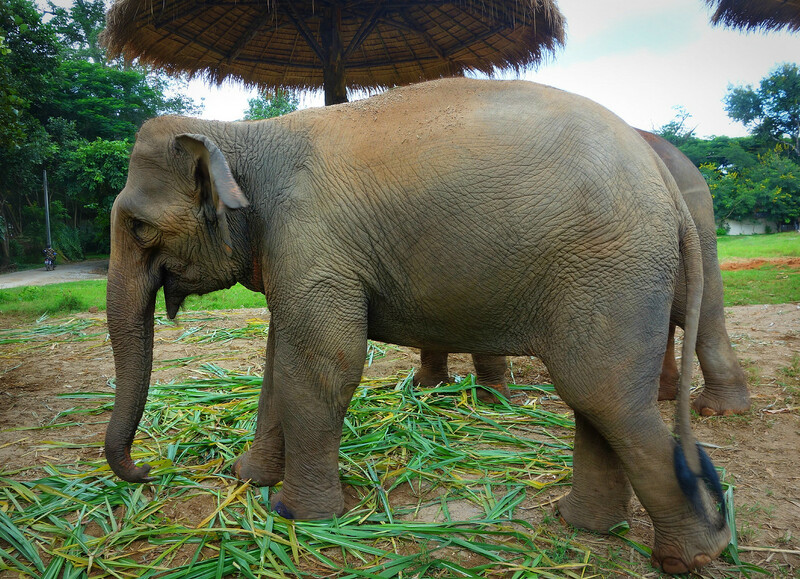 Rescued elephants often have physical as well as mental scars, and both take time to heal. Elephants naturally form family groups, and at the sanctuary they allow them to form the family groupings they choose. Some become aunties, some find best friends, and these family groups help them to heal emotionally. They are treated well, and eventually begin to trust humans again that are caring for them. These elephants can’t be released into the wild, both because they don’t have the skills to survive, and there is a shortage of grazing land due to development. Helping to bathe an elephant was awesome! A couple of friends chilling out together. One of these elephants is blind. Today there are around 4,000 to 5,000 elephants in Thailand, when there were 100,000 at the start of the 20th century. About half live in the wild, and half are privately owned or cared for. For centuries they have been used for labour and entertainment of people. Although using elephants in the logging industry has been banned in Thailand since 1989, many still have a life of labour carrying tourists. Asian elephants are much smaller than their African cousins, and carrying people long distances on their shoulders is a heavy burden. 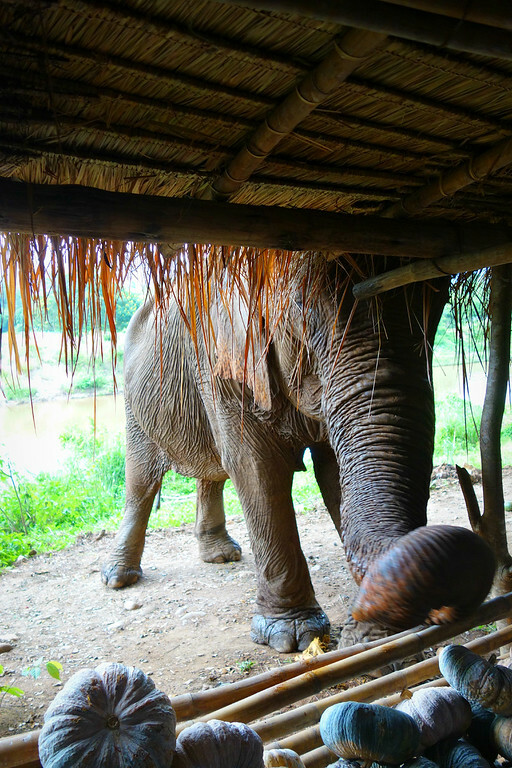 While elephants are revered in Thailand, in the tourist industry they are often mistreated. Wild baby elephants are taken from their mothers (who are often killed) and endure torturous training to control them through fear. They are harmed from the riding itself, from abusive owners, and they are often chained up when not on duty. Elephants performing in the street are often mistreated, and in an environment that is frightening and uncomfortable. Elephant rides are a very lucrative part of Thailand’s tourism industry, and it’s a controversial subject. The costs are high to feed and care for elephants, and there isn’t room in sanctuaries like this for approximately 2,000 elephants. Many owners need their elephants to work to cover costs, but as tourist dollars are supporting places like Elephant Nature Park, others in elephant tourism may adopt better practices. We all have to choose for ourself how our travel choices impacts others, and how our travel dollars impact the places we visit. Initially I was searching for a place to ride elephants. What we found was an opportunity to interact with elephants without exploiting them. 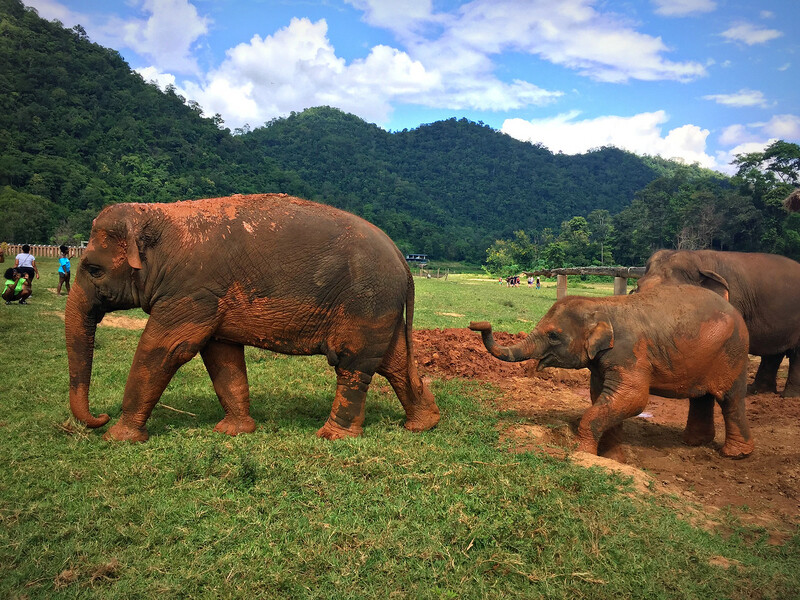 Our experience at Elephant Nature Park was inspirational, fun, and the highlight of our trip to Chiang Mai. This elephant was looking for a snack…and found one! Watching elephants, and they are watching us too. Visit the Elephant Nature Park website to book and learn more. Besides time with the elephants, our day included pick-up and drop-off at our Chiang Mai Hotel, a drive through beautiful countryside to the Park, and a delicious vegetarian buffet lunch. There are more ways to visit and volunteer at Elephant Nature Park, and other projects in Thailand and Cambodia. Lek Chailert is the founder of Save Elephant Foundation and Elephant Nature Park. She is from a small village north of Chiang Mai in northern Thailand, and understands the culture and challenges surrounding elephants. The Foundation’s approach involves local community outreach, rescue and rehabilitation programs, and educational ecotourism. Lek’s efforts have been recognized globally. Learn more at http://www.saveelephant.org/. Love what they are doing in the park, caring for the elephants well. When I went to Chiang Mai last year, we went on the elephant ride. But at one point, I felt sorry for the elephants having to carry humans all day to be able to get something to eat. I don’t think I will go on a ride again. I’d probably opt to go to a place like Elephant Nature Park instead next time. If you want a personal experience with elephants, the rescue parks are the way to go. When I started restarted researching what they do to the elephants to “break them down” so they’ll let tourists ride them in resort places I vowed I would not do that. 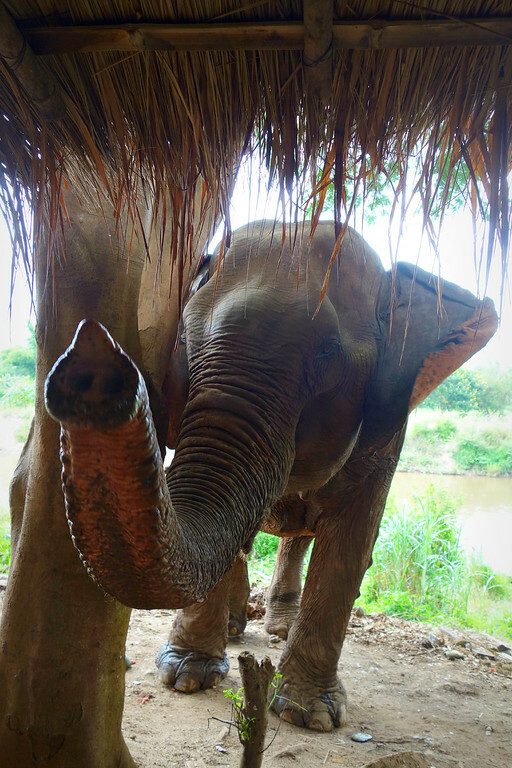 Great post about the elephants in Thailand! Thank you Patti! I probably would have gone for an elephant ride until I learned some of these tactics to make them submissive. The Elephant Nature Park is such a special place! We have gone there twice now, and will probably go back every time we visit Chiang Mai! I would love to visit again too whenever we have the opportunity! Elephant Nature Park is a wonderful place. We spent a day there last year and are hoping to go back to volunteer for an extended period of time in the future! It just fills you with joy to see how much of a wonderful life these beautiful animals now have. Like you, I fully recommend a visit to Elephant Nature Park if anyone visits northern Thailand. It is so important to educate people about the cruelty that elephants endure so that tourists can get that ‘elephant selfie. 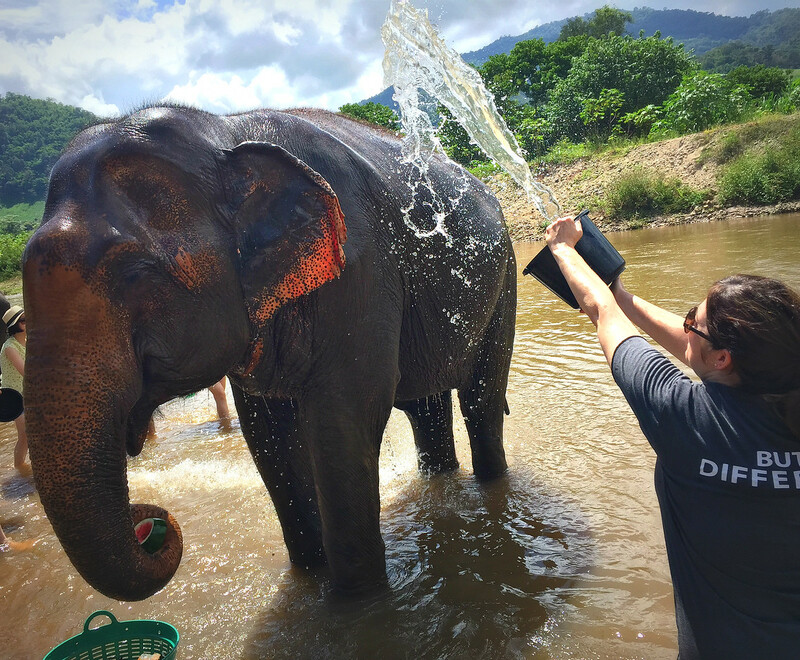 Unfortunately, after spending months in Thailand, we saw tourists riding elephants on a daily – so there is definitely a lot more education needed. It really was such a joyful experience to see these elephants also enjoying their day! We also saw people riding elephants, but hopefully as more tourists learn about this place they will consider Elephant Nature Park instead. I think you made the wiser and more humane choice. Visiting an elephant orphanage in Kenya was one of the highlights of our trip to Africa. I would love to see elephants in Africa some day too! Elephant Nature Park sounds like a great place to visit. I’ve read about it before and certainly think it is a better choice for seeing elephants as a tourist than many other sites where the elephants are mistreated. It was great to have this option for a wonderful elephant experience and also feel good about how they are treated. Looks to be such an interesting experience. 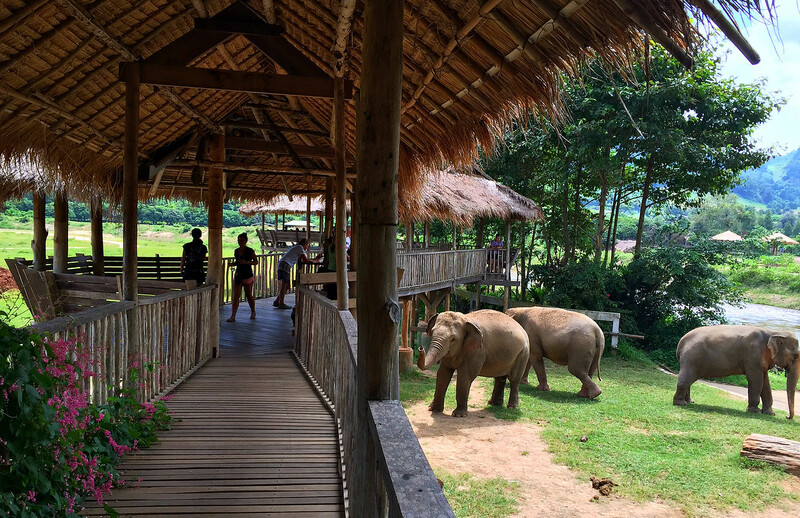 I’ve read several blog posts about the elephant nature park and it seems to be a positive interaction with the elephants and a place to learn for visitors. Your photos really seem to capture the experience. Thank you Patti. I think it’s impossible not to love this place! Thanks Anita, it really was a highlight. Hope you get there some day too! Very glad to see you found a much better way to interact with the elephants. They are very interesting and noble creatures. Elephants are awesome, and I loved learning how they look out for each other and form such tight friendships. 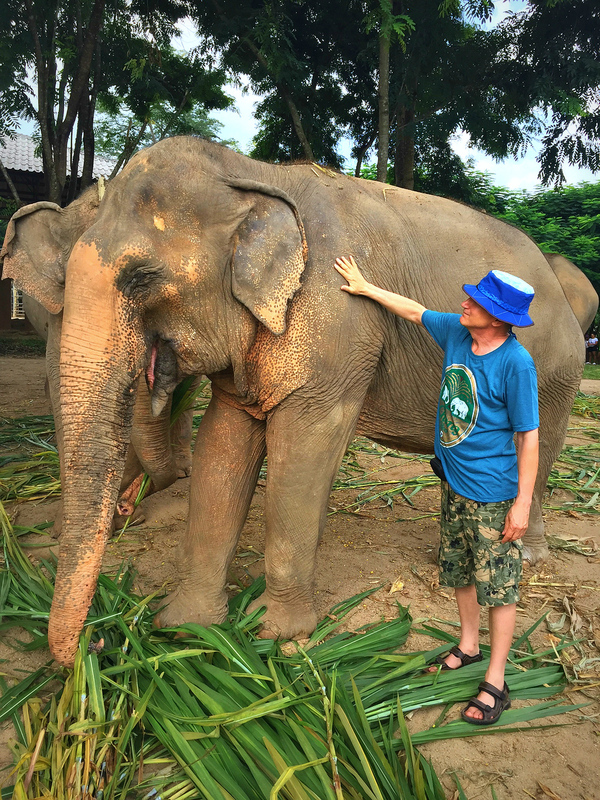 It was so wonderful to see these elephants who are loved and cared for, especially once we aware how hard the life is for those performing or carrying tourists. Because of Elephant Nature Park more tourists are aware of their impact.